Last night I was, once again, going through my archives of photos from Israel and I ran into this little Arab boy on a bike. 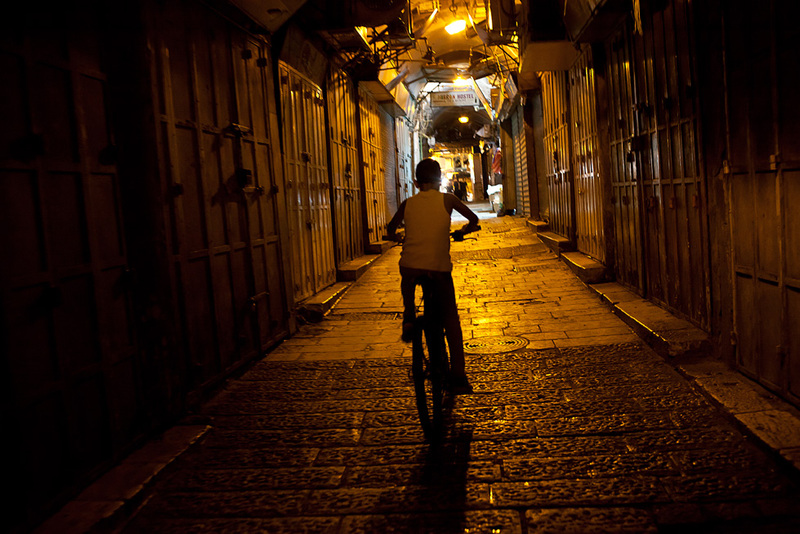 I remember when I took the shot and why I decided a kid on a bike riding around the Old City shuk was indeed interesting…it was a symbol of my time in Israel. That kid was me. I was that kid. I am that kid, riding freely along the market when the lights are dim and the people are gone. This was Israel for me. He was Israel to me. See, Israel is like a poison for people who visit for more than a week. It’s called the land of milk and honey for a reason, because once you leave it, you remain with this taste in your mouth that’s addictive. Inexplicably so. You miss the smell that you once hated, you miss the prayers you hear everywhere you go. You miss the screams at the market, you even miss seeing so many religious people everywhere all the time. You miss what you once thought was impossible to deal with. You even miss the soldiers waiting with you in line for the bus and then pushing you aside when it’s time to get on board. Israel has this magnetic energy that it’s absurd: When you first arrive there, you hate it. You think everyone is crazy for living in a country that was founded for Jewish people ONLY, but then you live in it like everyone else around you and you start feeling the magic. Nothing is every superficial in Israel, nothing is ever for granted there. Nothing is plain boring. The country is an intricate mess of young stimulating brains working toward a common goal. Yes, there is a war, there is a cultural and religious struggle with the adjacent countries, but peace reigns on the cities and the people who live for the pure purpose of living. In a country like Rome where form and formal dresses are so damn important, I miss the simplicity and the informality of the Israeli so much. I miss their laid back attitude and their laissez fair way of living where everything happens without them needing to stress about it too much. Israelis know how to live. They know how to enjoy life and be productive without expectations, even if they should learn to eat less theina and more mozzarella *(and maybe figure out that non-kosher wine, especially Italian one, is far better…) but nobody is perfect!